BPM has been continually evolving over decades, since the 1900s or earlier. One underlying philosophy does seem to be to take expert decison making out of the equation – although perhaps the practioners would deny it. The case studies presented are often of scenarios where nearly all decision making could be automated – such as a bank, managing supply chains in logistics, and developing retail products. The software developed for ‘business process management’ seems to lean even more to automatable scenarios – in one interview I did a company said they had done BPM implementations for ‘new employee onboarding’ and ‘managing billing processes’. Processes are important – very few organisations can manage without processes. Even highly creative industries, such as advertising agencies, use processes – (although there processes might not be anywhere near complex enough that they need to be written down, or encased in BPM software). But I would like to explore the idea that maybe we could take a different approach to BPM which is slightly looser – so expert work is not tied down into transaction or workflow style software packages. That point sounds complex – but to make it worthwhile understand, consider what advantages there could be if our organisations could do better work with experts in processes. Most world problems could be solved – climate, terrorism, refugees, health management, developing country electricity and water supplies. Organisations could be much better managed – including making sure they don’t go bust, can pay their employees steadily, and don’t cause accidents. This approach could work in any organisation which would like to improve its performance. Companies would compete on how well they can put processes and expert work together. This sounds like an interesting world. can better software help stop terrorism? Stopping terrorism requires a tricky combination of expertise, processes and software. Many people imagine a future where all human movements can be continually tracked and recorded and it might be possible spot a terrorist just with a ‘big data’ analysis alone. That could be unlikely (without a big erosion in civil liberties) – but meanwhile we do have a lot of data, it just also takes expertise to understand it. Meanwhile the software systems to manage the terrorist catching process, as I understand it, are fairly rudimentary – lists of people ‘suspected of being radicalised’, e-mails from other jurisdications saying that a person of interest has just done something, and so on. So perhaps the best chance of building a good expert + software system is one where you have software which continually analyses and manages the data available, and experts who can see data relevant to them and look for patterns – the sort a computer could never find. We’re using the term ‘common sense’ to define skills a human has which a computer doesn’t have. Its not a very scientific term, but if you believe in human judgement of this kind you’ll accept our use of it. The human can use their common sense to work with the data and spot things. I am guessing securtity services probaly segment the roles of spotting terrorists with specific individuals tracking specific groups of people. We often hear the number of people suspected of being ‘radicalised’ is too big for the manpower resources available – tracking one individual continuously cane take 20 staff members. But if one person is tracking say 100 people by constantly looking at their electronic footprints, with whatever data is avaiable (mobile phone? passport scan? credit card?) then it all looks different. The behaviour model of a potential terrorist might well be very different to the behaviour of anyone else (although I’m not an expert). Perhaps what’s missing here is the right approach to building such a software system – a gap which we hope to fill. Another observation is that perhaps security services have the same weakness with tracking terrorists as computer systems have with tracking viruses – they focus too much on entry and exit points (scan the computer program you just installed, monitor the country’s border) rather than look for patterns of activity with software already on your computer or with people already in your country. That’s harder to do with the transactional way we usually build software, but perhaps easier to do a better job at, with the right human skills. We are still not hearing very much about the ‘low code’ software idea – is that because it is still confined to niche areas, or programmers feel threatened by it, or it doesn’t work too well? Leading to experts and organisations which employ them being able to learn, develop and mature much faster. Do you think this all ought to me moving faster? There’s a role for the person who gathers stories about what people are doing, what works and what doesn’t, and aims to provide this story to the right person at the right time. This person is called a journalist. Is there a way we can use journalists – or people with journalism – as part of a software system? The software would need to understand when an expert might need the story, and present it at the right time. Employing journalists is expensive – but having the right story at the right time could be enormously valuable. People don’t typically like to spend lots of money for software – which makes it hard to do something like this. Maybe something could change here? How can cybersecurity be improved with better software? Let’s start with the experts who have the task of spotting something going on which shouldn’t be – running corporate or government systems. Setting a key performance indicator – known attacks per day, percent of attacks known to be succesful – is a start, but not very helpful. This is a task where experience is enormously helpful – peple know what to look for, what the patterns are, what to see. Ideally you’d have a knowledge base of people’s experiences with different attacks, how it was done, how it was spotted. Then you could build software which would automatically scan for suspicious activity as described and flag it up. This would be a lot of building software, adapting software, gathering stories about people’s experiences, showing the right experience at the right time, continually building a knowledge base which connects and indexes to the scanning and detecting. That’s not how this software is usually built, I think! Let’s say we want to install a software system to help a company be better at helping experts to continually improve. Firstly define what specifically it wants to improve – for example more reliable water supply, less CO2 emissions, less accidents, less non productive time. Next come up with some key performance indicators which will give an indication of whether things are going in the right direction. For example for maintaining a water supply in Mumbai, where there are regular water outages. Is the problem leaks, lack of pressure, not enough water being supplied in the first place? I don’t know but a local expert would. An expert might tell you whether a useful key indicator is the amount of water supplied to the grid (vs consumption), the number of blockages, the number of leaks, problems from lack of pressure (needs pumps). If the problem is water supplied to the grid, then you could set a project to reduce consumption and increase supply, and write down factors which show you’re going in the right direction. My point is that this is a question only an expert can answer. Once the expert has answered this question, then the software people can start building a system (working together with experts) – and then iterate until they get it right. How many organisations – government and commercial – would basically like their experts to be able to learn faster – but with their knowledge captured in a computer system as they go? How many experts would like to be able to learn faster, with good tools to help them? 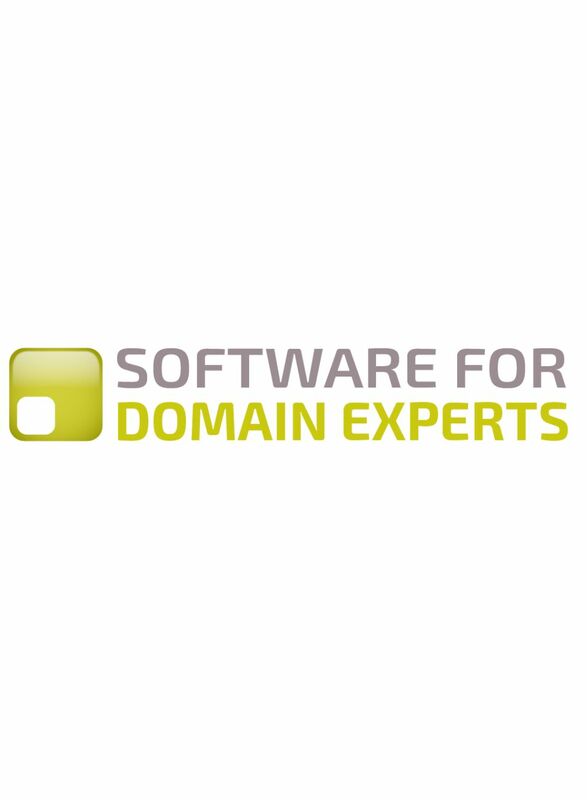 That seems like a good starting point for Software for Domain Experts. There can’t be a company or government organisation which doesn’t want better work from its experts – but there are organisations which are under more pressure. We can think of oil and gas companies (with the oil price so low), government organisations in India (under pressure to implement Prime Minister Modi’s reforms), and security agencies (under pressure to stop more terrorist attacks). But there must be plenty more examples. There are 2 business models here. One is where the expert resides in a big organisation (for example an oil and gas engineer). The ‘Software for Domain Experts’ business model is to make software tools for these people to use. The other is where the expert works as a consultant or has his own small business to provide a task (such as a recruitment consultant or specialist advisor). This expert can build specialist tools (perhaps working together with progammers) to help him or her provide this service. An expert could be described, in the simplest possible terms, as someone who receives information and makes decisions. The expert has enormous knowledge – experiences and facts – which help her understand what is going on from the data in front of them. So what the software needs to do, first and foremost, is deliver the relevant information. This means the software needs to understand what the expert is trying to do and what the expert needs (we can call this ‘modelling’). Working out what the expert needs will vary as a challenge. Some experts may have very narrow data requirements. Some may have broad and complex requirements. Perhaps working out what information the expert needs is the most difficult and critical part of this. “Key Performance Indicators” are widely used in organisations as a measuring stick. Take some index which will show how well you’re doing, measure it, and use that to see how well you’re doing. As a simple example, for most business managers, the profitability of their division is a key performance indicator. For safety managers, it could be the number of accidents. Narrowing someone’s work to a single key performance indicator can be dangerous – in other words, people are so solely focussed on achieving it – perhaps they have been promised a bonus if they achieve it – that they don’t notice something else going on. Now when it comes to expert work, these indicators can need careful design. You want people to focus on the indicators, and you want that to lead to the results you want. That’s hard. For example, I have been talking to someone who believes that the best way to manage climate emissions is to monitor or control the amount of oil and gas production or import. Perhaps what he’s really saying is, for the person in the hotseat of making sure a country’s emissions achieve the target trajectories the politicians have promised, one really good way to do it is count your fossil fuel import and production. If its going down, your emissions are going in the right direction. That’s an easier KPI than actually measuing the carbon emission itself, he believes. My point is – what if my friend is actually designing ‘software for experts’. He’s envisaging what the expert ‘dashboard’ is like. (The word dashboard conjures up ideas of a million screens and bits of data, which is not what people want either). Perhaps that’s a really difficult task, worthy of our best thinkers – the real business analysts. I’m sure ‘user interface designers’ are great people, but somehow the term ‘user inteface’ doesn’t convey how hard and important it is to get it right?